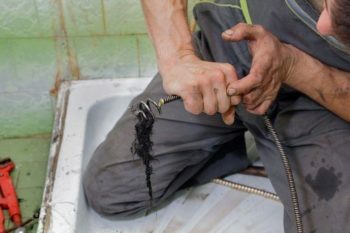 When Should I Call a Plumber for Hydro Jetting? Perhaps the most common reason that homeowners call a plumber is that their drains aren’t working properly. Sometimes, the water goes down slowly, taking much longer than it should. In more severe cases, the drains could stop working entirely. If your home remedies aren’t doing the trick, your best bet is to call a local plumber for help. There are many reasons that a drain can slow or stop working. Dirty drains and clogs are some notable reasons, and a modern, effective way to clean drains and remove clogs is by a method known as hydro jetting. For many years, the primary way of removing clogs was by using a plumber’s snake. A traditional drain snake is an auger that is spun into a drain that will dislodge any clogs or stuck particles, effectively restoring the drain to working condition. One problem with this method is that a fast-moving piece of metal could potentially miss sections for cleaning and could also damage certain types of pipes or fail to extract tough clogs. To combat this, hydro jetting was invented. Similar to a conventional plumbing snake, hydro jetting involves feeding a cable down the drain that cleans as it goes along. Where it differs is how it does this. Instead of a piece of metal, hydro-jetting uses highly-pressurized water. The nozzle sprays out continuously with PSI ratings comparable to a commercial pressure washer, meaning that dirt, debris, sediment, and clogs are all removed. Does this mean drain snakes aren’t used by reputable plumbers anymore? Not at all. While many plumbers prefer using hydrojetting for complex jobs, that doesn’t mean that the traditional methods are completely obsolete. One of the main reasons to avoid the hydro jet method is when your home has older, fragile pipes. Because water is sprayed with extremely high pressure, the pipes need to be strong enough to withstand the force, which isn’t always the case for older systems. But how do you know if your pipe material can handle it? Any competent plumber will check the condition of your pipes before deciding on which method of drain clearing is ideal for your specific situation. This is often checked via a video line inspection. A video line inspection is when a camera is inserted into the pipe and pushed through. It allows a plumber to see your pipe material and condition in real time. If there are cracks or indications that high pressure could increase damage, a different method will be advocated by the plumbing crew. Couldn’t a drain snake break damaged pipes too? It’s certainly possible. If both could potentially cause a pipe burst, then what’s your best course of action? It may be time for a home repipe. Replacing old, obsolete pipes with new materials before a catastrophic event can save you a significant amount of money and provide peace of mind. When is Hydro Jetting Typically Used? When the drains are dirty. Dirty drains can be filled with fats and oils that can build up and stick to the walls of the pipe. This can be soap scum, hair, and anything else flushed down that can adhere to the pipe. The strong cleaning of the water jet can remove all of this buildup and make your pipes nearly as clean as if they were brand new. If tree roots caused the drain problems. One particularly troublesome form of drain clogs is when tree roots block your sewer line. This issue may seem rare, but it plagues many homeowners each year. A powerful hydro jet can break up the roots into small bits that can be forced down, although you may still need your plumbers to make sure to stop the problem from reoccurring. After other methods don’t work. Plumbing can be very puzzling, which is why it often requires experts to solve the problem. Sometimes, what seems like an easy job that a plumber’s snake can handle without an issue becomes complex. For these instances, hydro jetting is usually the next thing to try–after checking pipe conditions through the video inspection of course. Think you might be a good candidate for hydro jetting? Call us today and let our knowledgeable plumbers come to you.